A fabulous day organised by Directors Harry Faulds & Will McArthur....24 players split into two teams of twelve. Each player plays single, pairs, triples and fours matches and the winning team was the President's team. Top player of the day with most points was Director Jim Forsyth. The President's wife with help from friends laid on a superb buffet and the Presi's hospitality was as usual too generous! The evening ended with a race night for Director Terry Connolly who is walking the Great Wall of China for charity and a magnificent £600 was raised from the race night towards his charity walk. Was won by Nancy McDonald and Jim Low, runners-up were Eleanor Mclean and Tom McGuiness with the beaten semi-finallists Ann & peter Phillips and Jeanette Knox & Alex Latimer. With a win for skip Harry Faulds team. This triple now goes on to represent the club in the SBA tournament. Vice-President Billy Dunsmore welcomed our friends from Templeton BC to our annual fixture. 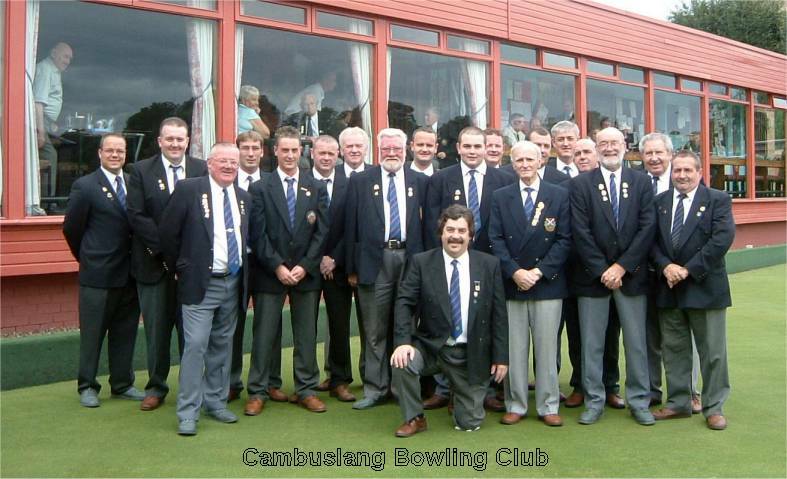 Two rinks and three triples fought out a very close contest with Cambuslang winning 81 shots to 78. Templeton President Gordon Leith exchanged badges with Billy and special mention was given to visiting guest President Jim Young from Farme BC who guested for one of the Cambuslang teams. Past-President Alex Latimer took a team to Halfway BC for our annual fixture and successfully held on to the cup. Presidents exchanged badges and a lot of friendships were further cemented. Aug 1st 2004 Cambuslang & Rutherglen Sports Council. 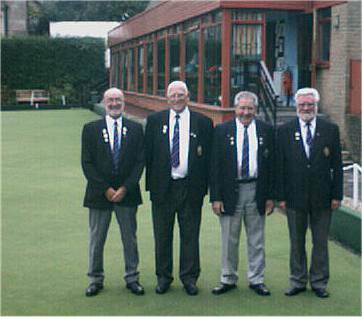 Since the inception of Cambuslang & Rutherglen Sports Council in 1996, the council has been active in the promotion of bowls. Events are organised during the year for juniors, 50+ age group, senior citizens and the champions of champions tournament. The tournament was held this year at Templeton BC. 6 local clubs entered their champions, Burnside, Cambuslang, Farme, Halfway, Overtoun & Rutherglen. Our own champion Tom McNee came third. and the winners were Cambuslang BC !!!! The Championship produced the best final of the day.....after twenty-three ends of bowling Tom & Craig were locked at 20 shots each. The last end found Tom lying game with Craig having one bowl to play,.his last, he fired and trailed the jack into the ditch to win the championship. matches are played in the months of May to August every year. At the end of August the four members with the highest points tally win..